Lenovo has sent TechRadar a statement clarifying that actor Ashton Kutcher is not helping the company develop smartphones. This runs directly contrary to a report last week that claimed the That '70s Show, Punk'd and Jobs star was acting as a product engineer and directly influencing a new line of Lenovo phones. The news was originally attributed to Lenovo Chief Marketing Officer David Roman, but now it seems he may have been misquoted or the information got lost mixed up along the way. 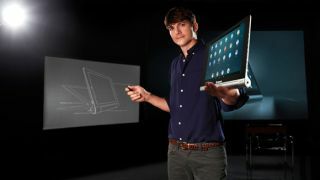 In reality, "the development agreement Lenovo has with Ashton Kutcher is for tablets only, and not for smartphones," Lenovo Executive Director of External Communications Ray Gorman told TechRadar in an email. Kutcher has been involved with the tech world for some time, having funded some big-name start-ups and co-founded an investment firm for that purpose. He signed on with Lenovo in 2013 as a spokesperson and product engineer, helping out on the company's Yoga Tablet line. In last week's report Roman was quoted as saying, "I know on one level, it sounds corny, but it is real … He not only sees himself as an engineer, but he is an engineer. If he sees a problem, he wants to solve it." It seems that sentiment still applies, but only to Lenovo's tablets and not its smartphones. We've asked Gorman for further clarification regarding this mix-up and will update here if hear back. The Lenovo Vibe Z is the firm's latest smartphone - here's TechRadar's analysis.